Is There A Link Between Emotions and Injuries? Episode #112: Is There A Link Between Emotions and Injuries? Click Above to Check Out The Book by Brad Nelson. In this September 15, 2010 free audio episode: how emotions cause injuries, can you lose weight with walking, what exactly is an interval, platform shoes for running, and are high fat diets healthy? Dr. Nelson begins by explaining the crucial link between emotions, health and injuries, and reveals how over several decades of research he has developed a powerful tool for healing injuries, illness and more by simply addressing underlying emotional issues. And then, this interview gets a bit crazy. Without knowing a thing about me, Dr. Nelson identifies a deep emotional issue over the phone that has been causing my knee pain – and fixes it, via a phone call, without even touching me. I'm a reasonable and open-minded guy, but I'm also critical. However, I do know my own body, and I know what Dr. Nelson does actually works, so you don't want to miss this interview. Click here to sign up for any of Dr. Bradley Nelson's seminars, in which he teaches the same type of techniques he used with me over the phone. OR click here to get Bradley Nelson's book: “The Emotion Code”. I've already ordered and am anxiously awaiting my copy! -Flexible Option: if you simply want unlimited Q&A e-mail access to Ben Greenfield, it is $175/month. Click here to sign-up. 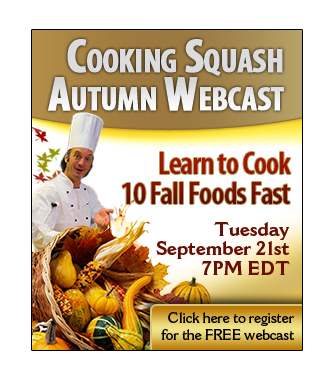 –Tuesday, September 21st, 7pm EDT: What should you do with squash? I'm wondering right now how Chef Todd will create ten new Fall foods using Fall ingredients like squash in under 60 minutes. Can that even be done? You can find out when you register for the FREE cooking webcast “The Cooking Squash Challenge” by clicking here. I know I'll be watching, I hope you will too! -Rock Star Triathlete Academy only open at $37 for one more month, and then tuition will increase to $67. Get in now if you want in at the current member price, along with a $1 14 day trial. Click here to check it out. -Triathlon Dominator RE-LAUNCH. On October 4, 2010, Ben Greenfield will be adding an audio release entitled “Top 10 Mistakes Made By Triathletes”, a 3 month off-season training program, a special “Golden Ticket” to his worldwide triathlon camps, a new manual that teaches triathletes how to qualify for Ironman World Championships, and 3 day VIP access to the Rock Star Triathlete Academy, Ben's online training school for triathletes. The promotion will be offered until October 9 at midnight – the same day that coach Greenfield will be competing in the Ironman World Championships in Kona. Get in now at http://www.triathlondominator.com. -New Refund Policy for Austin Training Camp: you can sign up now by clicking here, still get the early bird discount, and Ben will honor refunds until December 1! Think forward to your training next January…Will you be tired of the indoor trainer and the treadmill and that black line on the bottom of the pool? Are you going to be struggling to stay motivated for those wet 5-hour slogs in this rainy/snowy winter climate? Are you planning on ANY 2011 triathlon event from Olympic distance up to Ironman? Then this event is going to be perfect for you. Pacific Elite Fitness is proud to announced an Official 2011 Triathlete Training Camp, January 31-February 7, 2011 at the Endurance Ranch in Austin, Texas! Click here for more details or to register now. Jarrett asks: I've been eating healthy and I exercise almost daily, but my exercise is mainly walking and jogging the streets and blocks around my neighborhood and I mainly go without any set path in mind. Is the reason I've been at a Plateau with my weight because my body is used to walking and jogging the blocks? Do I have to run to start losing more weight? I weigh around 200 lbs. and my ideal body weight is 170-180 (I'm 5'10” Male). Steve asks: I do weekly bike intervals with my tri/road group consisting of mile or so loops with an equidistant recovery loop at an easy pace. I do weekly run intervals on the track which consist of a distance like ¼ mile sprint followed by a ¼ mile recovery lap at an easy pace. In my masters swim class, however, intervals means swim say a 100 meters on 1:40 or 1:50 and rest at the wall for whatever time you have left in that interval. It seems like the equivalent would be swim a 100 at sprint pace and then swim 100 at recovery pace. Why is the term intervals used so differently in these different sports? Is there a training related reason? Thanks. spoonsister asks via twitter: @bengreenfield what about all these basketball strengthening shoes? walking might be ok but couldnt it jack up running gait? tempting tho. Graeme asks: As part of your Bioletics testing protocols they told you that you were a Protein type or Fast Oxidiser. Have you decided to amend your diet based on this? And specifically what are your thoughts on adopting this recommended diet which includes higher proportions of animal fats that a lot of other diets. Metabolic typing seem to discount cholesterol concerns as a major issue. Thank you, thank you, Ben for talking about the cholesterol myth! I am still so surprised at how many people are cutting out good fats from their diet because they think it will cause heart disease and even more surprised by the doctors that prescribe low-fat diets for this same reason. Just caught podcast#112- awesome. Along those lines, if someone hasn’t recommended it to you already, you should check out Bruce Lipton’s “The Biology of Belief”. Because the nutrition is based on a testable, demonstrable principle, whereas the emotional treatment is not. I made absolutely no claims about the scientific validity of the emotion coding for those reasons. I simply observed that it helped me feel better. There was not measurable here, only qualitative exchanges of information. By definition, "To be termed scientific, a method of inquiry must be based on gathering observable, empirical and measurable evidence subject to specific principles of reasoning". Because I am not pursuing the Emotion Coding as a scientific inquiry, I have no obligation to use The Scientific Method in my reporting upon my experience with it. I _totally_ agree that there are things that can't be proven/disproven by The Scientific Method, but… how can you reject the validity of a study on pre/post-exercise nutrition because it was conducted with the subjects in the sample in a fasted state as inapplicable to an athlete's nutrition strategy because they don't typically mirror that in their training, and then accept some witch-doctor's technique as valid? I _strongly_ believe in the placebo-effect. It's not the placebo-no-effect… I'll take that over continued illness/injury any day, but… It's a serious cred issue if you arbitrarily pick and choose when you apply research and anecdote. We love you Ben, but come on… Which side are you on? Anecdotal evidence is not valid in any way, shape, or form… This podcast seriously compromises your credibility, Ben. I listened to your tri-talk podcast today, and it stands in stark contrast to the hocus-pocus mumbo-jumbo this guy is pushing. Very disappointed… You closely scrutinized the experimental design of the studies you cited; how can you swing both ways? I do believe that there are some things that science cannot prove, and that we cannot see, feel or touch. I don't think I can be judged too harshly for that, since every religion would have to be written off if that were the case. This is the same reason I pray for people when they're sick. Science can't prove they'll get better, but I believe it will help. Ben, you simply have to start each podcast with a knee update from now for the next 6 months. The BKU slot (Ben's knee update). I am so conflicted by this item – your podcasts are so dense with factual material I can't remember even 20% of it so I have every sympathy with Scott. iT was very very strange. Scott – maybe you have an injury and Ben could set up a Skype link between you and the good Dr. An experiment needs to be repeatable after all ? Ben – what did you think of his book ? Did it really provide you with the tools to undertake this for yourself ? Good idea John. I read the book and didn't agree with some of what was in it, but do agree that emotions could perhaps be linked to more than just "high blood pressure" but tightness and injuries as well. One part of the book talks about how if you have a "weak link" or injured body part, often that can be a susceptible area to carry emotionally related tightness. The knee is still fine. It's still blowing my mind. I found the interview very interesting. This concept reminds me of acupuncture in that both are meant to clear energy imbalances of some kind and both attempt to address the cause of a problem instead of treating symptoms only. I'm curious to learn more; thanks for being open-minded! Scott, I have to be somewhat open-minded as a journalist. I just finished his book last night, and while I can't say I'm convinced by everything in it; A) you can't deny that there is a link between emotions and health and B) even if it is just a "placebo" effect, I have seen it work twice now. I believe that there is a link between emotions and health, I just don't believe you can solve problems with a list of questions from a fortune teller and a magnet over the phone. Stating that I am a skeptic would be an understatement but I am certainly glad it worked for you. I've used accupunture in the past and its helped me. I really enjoy your podcast- thanks for all your hard work. It is amusing to watch people’s reaction when you knock their cozy little belief systems and traditions out of their tightly ordered, narrow-minded little box. They often react in anger and lash out as many did when you put the Emotion Code on your site. I applaud your openness and willingness to explore these possibilities. I enjoyed the podcast, bought a copy of the book, and thoroughly enjoyed the book, which is filled with pretty decent “science” behind its philosophy. I am not some wacked-out new age metaphysical guy who gullibly believes everything he reads, either. I am a 52 year old corporate executive, who has lead large organizations, made millions personally, run triathlons, been married to the same woman 28 years, raised three very successful children to adulthood (one professional baseball player, one attorney, and one college student), a leader in church and community, and I sit on the boards of numerous charitable organizations. I am wise enough to know that there is so much I don’t know about how the universe works, and guys like Dr. Bradley Nelson help us to explore the frontiers of what we know. They will always be attacked by the skeptics and critics who have achieved little to nothing in their life other than to criticize those who are bold enough to voyage beyond the horizon of the “flat earth”. Keep up the great work on the podcasts!